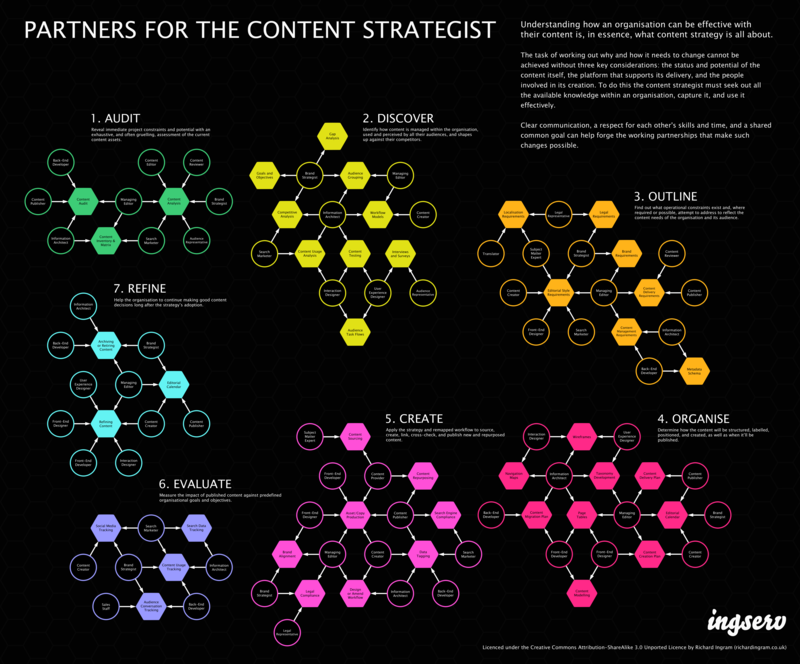 Like many of the disciplines concerned with designing for the web, content strategy is a rich and colourful conglomerate of overlapping approaches. Can we really square the circle of being a content strategist and not being, in some senses, an information architect, user experience designer, or technical communicator? This isn’t to say that the content strategist lacks the defining element of their professional purpose. On the contrary, I believe that when every facet, subset, and silo is boiled down all that remains is the single task of understanding how an organisation can be effective with their content – everything else, that’s fuelled and measured by it, I regard as external. Note: This work is licenced under the Creative Commons Attribution-ShareAlike 3.0 Unported Licence. By all means bend, shape, and prod it. This is simply brilliant – thank you. I have now downloaded the above DNA into my neural net and will be a better content strategist for it. @Ahava: Seriously, when I consider the depth to this subject, an hour’s presentation isn’t bad going at all. I’ve only provided an elaborate front door. @David: I’m humbled by your words. This makes the whole process worthwhile. How do you do it!? Another stellar info-viz! Your work is playing a key role in defining the content strategy discipline, I hope you know that!